THE TABLES ARE FINALLY HERE! Our whole renovation process seems like it has taken forever, but I am excited to say that our recently expanded space now has more tables and chairs. We have added 6 more tables and 12 more chairs – and it looks great. What’s even more amazing is it looks like we could have used a few more tables and chairs. Your response and support of Tazza D’Oro are greatly appreciated. 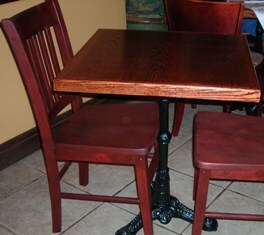 So come on down, grab a new table and chair and get an espresso drink from one of our certified baristi.